Around this time in the year 1205, the fleeting Byzantine emperor Alexios V Doukas was put to a dramatic death in Constantinople’s Forum of Theodosius by being hurled from the top of the ancient Column of Theodosius. 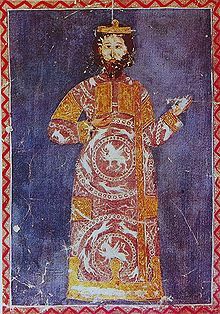 Nicknamed “Mourtzouphlos” for his prominent brow, Alexios obtained his Pyrrhic purple by being the only elite with wit and courage in Constantinople during the horror of the its sack by a Venetian Crusader army. Vanity, vanity, all is vanity! Hands in mailed gauntlets and silk gloves grasping after glory and treasure were our Emperor Eyebrow’s rise and his fall. The prime desideratum was the prime desideratum, Jerusalem. In a monument to bad management, a Crusader army of 12,000 was mustered to Venice in 1202 for a flotilla suitable to thrice its number. Venice had taken on an enormous contract to assemble this fleet and since the soldiers who showed up could in no way pay what the Serene Republic had been promised, Venice simply repossessed the army to make good its debt by means of pillage. First, it sacked Venice’s Dalmatian rival Zadar. Then, having picked up the exiled nephew of the reigning Byzantine emperor — the uncle had overthrown the father to get the job — the Crusader-mercenaries made for Constantinople, become now shameless Praetorians by dint of young Alexios’s assurance of all the liberalities the East’s treasuries could bear. Constantinople in 1202 was the jewel of Christendom. Its mighty walls had preserved the city inviolate since antiquity — a city of half a million souls reposing in the splendors of the Roman world, augmented by eight more centuries’ imperial surplus. A morsel so ripe needs but one unguarded moment for some ruffian to pluck it. The Crusaders’ attack so happened to catch Constantinople, at long last, at such a moment. The city was lightly defended and unable to summon more aid — while under the direction of an emperor, Alexios III, who had been cruel and profligate in the enjoyment of his power but vacillated fatally when he was required to defend it. In a matter of days in July of 1203, Alexios’s rule collapsed, and the emperor himself fled, when the Crusaders besieged Constantiople. These Crusaders of course installed their scheming moppet as Emperor Alexios IV, actually co-emperor with his father who despite having been brutally blinded by his brother was liberated and acclaimed by the populace. The ensuing months make painful reading — and surely much worse than that to experience at first hand. The new emperors feuded with each other despite their kinship. They also had to squeeze every revenue they could for the Crusader army, which stubbornly refused to depart as its leader, the nonagenarian Doge of Venice, schemed to establish lasting Venetian authority in Byzantium. Irritated residents, enduring the continued presence of a Crusader army that thought it was supposed to be going to Jerusalem all along, rioted and fought with one another. The bottom line was that young Alexios was no more impressive in power than had been his predecessor and he had the added disability of having been installed by a foreign invader. He also discovered to his chagrin that the staggering sum of 200,000 he had so lightly promised the Venetians in exchange for his throne was double what he could actually find in the capital. When the situation unmanned him in January of 1204, he cowered in the imperial palace and sent his chamberlain to petition the Crusaders to back him in the latest exigency. That chamberlain was our man, Alexios Mourtzouphlos. Acting with an alacrity that might have spared Constantinople a horror had an earlier prince exercised it, Alexios instead arrested the co-emperors and spirited them off to a dungeon where they were quietly murdered. The usurper then turned the city’s energies towards reinforcing its battered defenses and attempted to mount an attack against the Crusaders. This proved, however, much too late to spare the Second Rome its most awful tribulation. It was not given Alexios Mourtzouphlos to see what horrors ensued for Constantinople, never mind to get a start on finagling an imperial comeback of his own. Fleeing the sack of the city, he wound up in Thrace in the company of yet another deposed ex-emperor. But after first allowing Mourtzouphlos to marry his daughter, that old schemer had Alexios V blinded and in November 1204 abandoned him to an advancing Latin army — and its eventual death-by-precipitation — while his former in-laws fled to Corinth. * One of Alexios IV’s promises to his Crusader buddies was to submit the Byzantine patriarchate to Papal authority — another pledge that could never have been realistically delivered.